"But we had to celebrate and be glad, because this brother of yours was dead & is alive again; he was lost and is found." Snow tubers will enjoy Alpine Slide Big Bear. There you can pick up an all-day pass for their walk-on lifts and race your friends. HERE is their waiver. Wondering WHAT TO BRING? Click HERE. Winterblast '15 LAST YEAR'S PICTURES. Click on the side picture to enlarge. 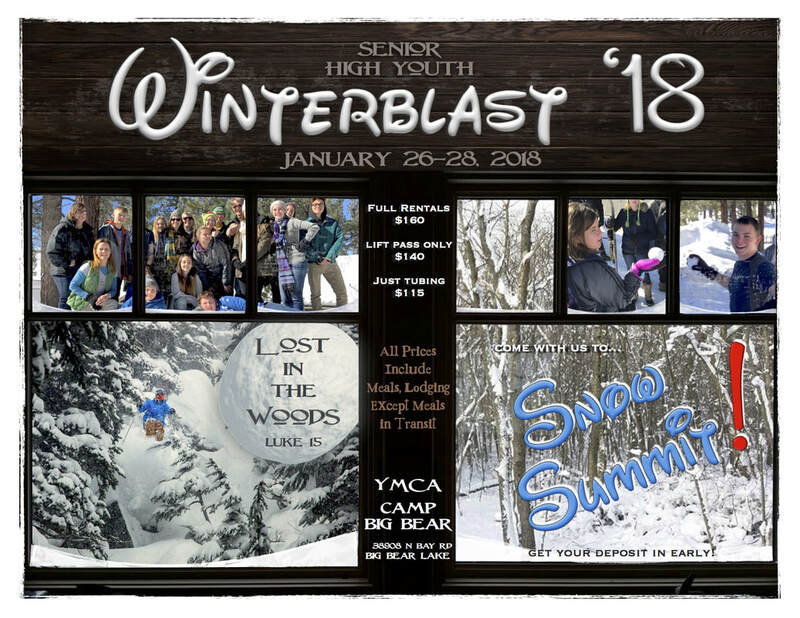 Or you can DOWNLOAD & print your own Winterblast flyer. * all prices include meals & lodging (except meals in transport). Checks can be made out to "Peace Lutheran Church" and placed in Mike's mailbox in narthex (or mailed to: Peace Lutheran Church 71 Loma Dr Camarillo, CA 93010). Please put in memo section that check is for "Winterblast '17". * IMPORTANT * Here is Snow Summit's LIABILITY release you need to fill out. And for a YMCA Camp Big Bear RELEASE just use your own church's release (Peace's is linked next). Thirdly, for Peace Lutheran participants, here is our Peace Lutheran RELEASE. Check out Camp Big Bear where we'll be staying. Here's a MAP. It's only about a 20-minute drive to Snow Summit resort where we'll be hitting the slopes!